Most Americans understand that raising their credit score is important, but many do not comprehend just how vital it is to their overall financial stability. They may have some idea of what their credit score is, but don’t know how to improve it — or what number they should be shooting for in order to improve their financial outlook, such as by qualifying for a lower interest rate on a loan. A credit score is a three-digit number created by a mathematical algorithm based on information in your credit report. It uses information such as whether a consumer makes payments on time, the total amount of debt owed, and length of credit history, to predict whether a person is a credit risk. While there are a number of credit scoring methods, the most commonly used number is known as the FICO credit score. A FICO score can range from 300 to 850; the higher a consumer’s number is, the lower a credit risk he or she is. In other words, you want your FICO score to be as high as possible. A FICO score of 850 is considered a “perfect” credit score. While few Americans have attained this stellar rating, it is possible to reach this pinnacle. If you don’t know your credit score, you can access it for free through Credit Sesame. Credit Sesame will help you track your score and give you great advice on improving your credit rating. I love using their app and highly recommend signing up with them – particularly since it is free. By understanding what goes into your credit score and by carefully tending to your finances, you can work to build up your score — and achieve the ultimate goal of a FICO rating of 850. Having a good credit score is critical to your overall financial stability. Banks, credit unions, and other lenders all check your credit score before lending you money. Other entities may check your credit score as well, such as a landlord before allowing you to rent an apartment, a utility company before allowing you to start service, or even an employer before hiring you for a sensitive job. As noted above, a good credit score indicates that you are a good credit risk. It indicates to a lender or another entity the likelihood that you will default on a loan or other financial obligation within the next 24 months. For that reason, lenders rely heavily on these numbers before making decisions on whether to approve a loan and what the interest rate on a loan should be. A person with a low credit score might be denied a mortgage or a car loan, for example, or only be approved with a particularly high-interest rate. Over time, having a high-interest rate can cost a borrower thousands of dollars in interest payments. Having a good credit score – of usually at least 700 – not only allows you to obtain financing, but it enables you to get it at a fair interest rate — which saves you money and allows you to build up your financial stability. It also ensures that you will be approved for housing, and won’t be turned away from a job or even obtaining insurance because of a bad credit score. Because your credit score can impact nearly every area of your life, raising your credit score is vital to being able to accomplish your goals in life. First, a consumer’s payment history determines 35% of his or her overall credit score. This includes all payments made on accounts, including all late payments, missed payments, and overdue payments. The importance of making regular, on-time payments for all bills — from the water bill to the cable bill to student loans — cannot be understated, as this factor is given the most weight. Anyone looking to improve their credit score should focus on making all of their payments on time and in full. Second, the amounts owed on your debt determines 30% of your credit score. This involves looking at not only at the total amount owed, but the amount owed relative to the credit available, which is known as the credit utilization ratio. Ideally, a consumer’s credit utilization ratio should be at 30% or less, which demonstrates that you are responsibly using the credit available to you. For example, if you have a $10,000 credit card limit and carry a balance of $2,500, then your credit utilization ratio would be 25% — within the maximum suggested ratio of 30%. Third, the length of your credit history determines 15% of your credit score. This includes the length of time since you opened particular accounts, and how long it has been since there was activity on a given account. A lengthy credit history can help build up your credit score, as it demonstrates that you have a track record of paying off your debts. Fourth, the types of credit that you use determines 10% of your credit score. The type of accounts that you have, such as revolving credit card debt installment loans, and other debt, will be factored into this part of the equation. This shows that you can handle different types of debt responsibly. Fifth, new credit inquiries determine 10% of your credit score. A pursuit of new credit, including the number of new credit inquiries, can indicate that a person is in financial trouble. If you are looking to make a major purchase, avoid opening up new credit cards, as it can drive down your credit score. 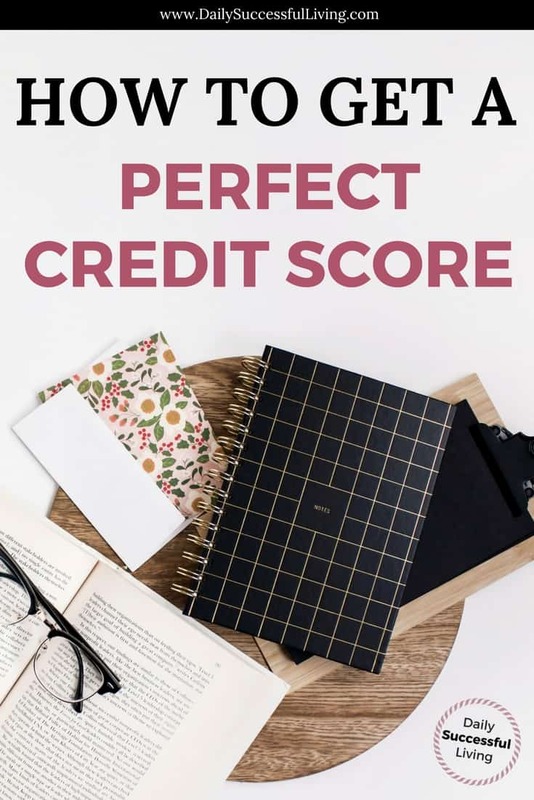 While it is difficult to obtain a perfect credit score of 850, it is not impossible — as demonstrated by the approximately 3 million people who have accomplished this goal. There are several keys to getting to 850, and they all involve paying careful attention to your finances. The most important factor in achieving a perfect credit score, is to never make a late payment or be delinquent on any account. Because your payment history accounts for 35% of your FICO score, having a negative mark on this factor will prevent you from reaching 850. Incorporating these payments into your budget– and even overestimating them when doing so – can help ensure that you don’t miss any. Next, you will need to eliminate or nearly eliminate your credit card debt. Because the amount of debt owed is the second biggest factor that determines your FICO score, not carrying credit card debt is necessary to increase your score. The third requirement is more challenging because it requires time: you have to have a long credit history. For most people, obtaining a perfect score of 850 is not possible until they have a credit history of 20 to 30 years. So, if you are relatively new to the world of credit scores, obtaining a perfect score is probably not feasible — but it can be if you keep working over-time. While hitting a perfect credit score of 850 may not be possible for everyone, the good news is that it isn’t necessary to get good interest rates on loans and other forms of credit. Don’t forgot to sign up with Credit Sesame so you can start raising your credit score as soon as possible. Keeping your credit score over 760 is likely enough to take advantage of the best deals — and that is something that can be accomplished by many Americans through diligence and paying close attention to their finances. This awesome post was written by Tom at Fired Up Millennial. He writes extensively on Student/College-related financial issues as well as retirement planning. I don’t write a lot about college-related issues since I’m now in my 40’s, but one of his posts that really stuck out at me was on choosing the right time to refinance your student loans. If you are a student I highly recommend at minimum reading this post. I made the choice to refinance my loans and saved a lot of money on interest. Tom is a millennial blogger who runs a personal finance site centered around achieving FIRE (financial independence – retire early). You can find him on Twitter @FIREdUpMillenn to follow his journey and stay updated on his newest posts.